In Order to Form a More Perfect …Beast? I. Today is Constitution Day in the United States. Over its next three section—Articles I, II, and III—the Constitution lays out, in surprisingly few words, the legislative, executive, and judicial powers, respectively, of the federal government. Article IV sets out the relationship of the federal government and the states. Article V (thinking ahead) sets out the process for amending the Constitution. Article VI, very brief, insures that the Constitution does mean repudiation of prior debts owed by the United States—indeed, it assumes the existence of the Nation, and declares the Constitution “the supreme law of the land.” Finally, Article VII sets out the requirements to ratify the new document. The main text of the Constitution is followed by a series of amendments, the first ten of which form what we call “The Bill of Rights,” protecting what we like to think of as the fundamental freedoms. Interestingly, though, the Bill of Rights is followed by an additional 17 amendments, the content of which ranges from matters as trivial (from an early 21st-Century viewpoint) the enactment and repeal of Prohibition (Amendments XVIII and XXI, respectively) to the abolition of slavery and the expansion of the rights of younger citizens (XIII, XIX, and XXVI). These latter amendments are just as fundamental as the first ten. Some are about fundamental rights, and some are about fundamental duties. Read your Constitution. Whether you love it or not, know it. It’s a remarkably short document. After 250 years, with all amendments, it runs to 21 pages in PDF format (in comparison, the new Iraqi constitution runs to more than 40 pages). That’s about all I have to say about that. Yes, I’m feeling better today. I worked on the bike and I rode it in this morning. I’m sitting in Bruegger’s right now, watching the morning creeping up Dixwell. It’s going to be a good day. Almost two years ago, I wrote what has been a rather popular post here. In case anyone’s interested, I’d like to report an upgrade to that project. Regular readers (hi there, you two!) know that I have a bag fetish. That is, I want the right bag for the job. This, sadly, turns out to extend to bicycling as well—though here I have a little more room for modifications. Over the past two years, my Garneau-based beast has worked well. 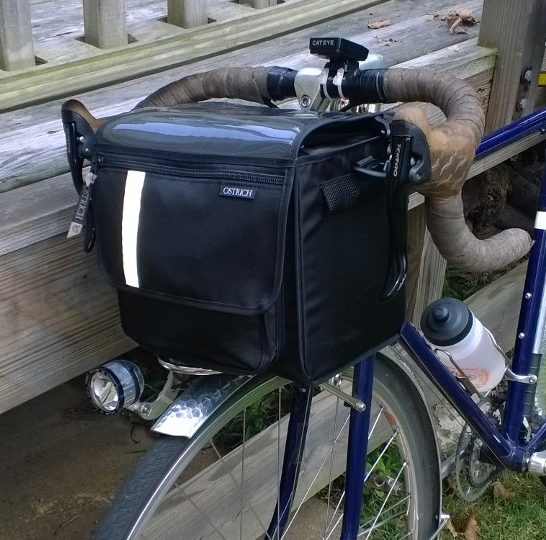 I’ve played with others, notably the Velo Orange Campagne bag and the Ironweed Orpington. Whie I liked both, for different reasons, each was not quite right for what I wanted. The VO was too small; the Ironweed, too enormous. The VO had hardware that rusted a bit, and tended to jingle; the Ironweed had the right hardware, but its pockets interfered with cables on my bike. The Orpington opened away from the rider with a buckle; the Campagne opened toward the rider but with a hard-to-use bit of elastic. My original beast was good, but the map case was difficult to use, and while it opened toward the rider, it closed with a “watertight” zipper, the plastic seal on which was deteriorating. Finally, I realized that what it had in common with the Orpington was that it came too close to my fingers on the brakes (I like a narrow handlebar—between 40 and 42 cm). So, back into the search. Someone on a message board happened to mention that they knew of a Japanese company that handled getting domestic products to international buyers. 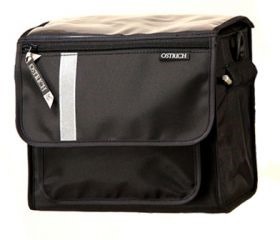 I browsed the site, and noticed that they handled Ostrich bags, which I had previously seen on Velo Orange’s site and in a few other places. They had seemed a little on the large side, but I thought I’d look just for the heck of it to see if Ostrich made a smaller bag. At about $50, plus shipping from Japan, this one is made of nylon rather than canvas (it comes in black or gray, and there is a slightly more expensive canvas version as well). It’s taller than my original beast, but has no side or rear pockets. It has one front pocket that closes with a Velcro flap that covers almost the entire front, and a small zipper pocket on the front of the flap (good for small things you don’t often need). Then it has a very nice large map pocket on top and—ta da!—closes at the back with Velcro. It was made to, and comes with straps to, fasten it to the handlebars and a rack. I removed these and performed a variant on the original beast’s attachment. So far, it’s pretty good. It’s narrow enough that my hands don’t feel squoze when I’m using the brakes. It’s large enough for lots of spare clothing, plus a small U-lock and cable. Reflectors are always nice. I dunno. I like it. Check back in a couple of years for a long-term evaluation. This entry was posted in Uncategorized and tagged bag, bicycle, bike, bike bag, constitution, depression, handlebar bag, Ostrich, Perfection. Bookmark the permalink. 1 Response to In Order to Form a More Perfect …Beast?